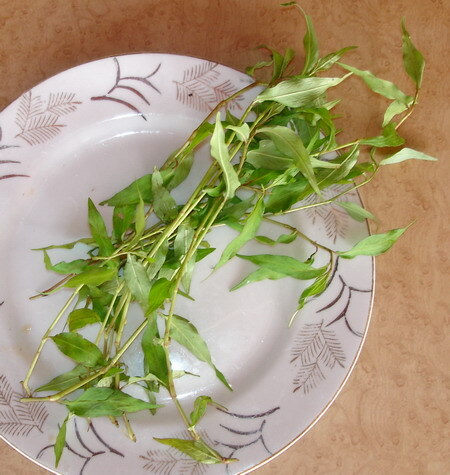 Grow your own daun kesum, the herb you must use for making laksa. The leaves are elongated, with soft stalk, each segment of the stalk has the potential to grow into another bunch of mint leaves because roots sprout from the stalk itself. You can grow your own daun kesum from any laksa stalks you sometimes get as garnish when you bought laksa from a hakwer's stall. Living in an apartment on the fourth floor, I do not have enough space for having a garden, but I can grow daun kesum easily from a plastic container (like used ice-cream tub) filled with some damp earth. The leaves are green and will turn yellow and then brown when they start withering. The stalks will grow and grow if you let them but usually I trim the tips to let them branch out. Other than laksa, the leaves can be used as an additional herb when you make nasi ulam, nasi kerabu and when you make asam pedas or other fish dishes. It can be sliced thinly as garnishing, eaten raw or added in sour spicy soup like laksa. The smell of this minty herb is strong and unmistakable. Therefore, it is good to be used in a fish dish with gravy to counterbalance the fishy smell. To start planting the herb is very simple indeed. Get a few stalks of fresh daun kesum from the wet market or if your friend has a herb garden, ask for some stalks from her. Place the stalks in a jam jar or glass filled with 1 cm of water. Let them sit for a few days until a substantial length of roots can be seen growing at the bottom of the jar. Transfer your stalks into a container filled with damp earth. Cover about 2.5cm of the stalks in the dirt. Make sure the bottom of the container has some small holes to let excess water to flow out. See, it is easy to grow your own daun kesum. 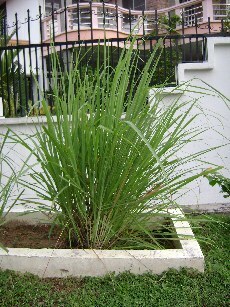 Lemongrass Shrub, the Malay word for lemongrass is "serai"
The herb needs very little maintenance except for enough water to ensure the earth it is planted in is always damp. Oh yes, also plenty of sunlight. You can place the herb pot at the window sill or if you have a balcony, place it there. It grows well in your backyard too. Fertilizer made of compost is good for the leaves. Old wives have this tip to nourish your herbs: use the bloody water that remained after washing and gutting your fish to spray on the leaves and earth, it is supposed to be full of nutrients for plant. Do this treatment every two weeks or so. Daun kesum grows very fast. Given good care and enough water, within a week you can already have a bunch filling up your ice-cream tub already. The method to grow your own daun kesum also applies to lemongrass. However, lemongrass needs more space because the leaves of lemongrass almost resembles a bunch of tall weed (lalang). Lemongrass needs a large terracotta pot or a large plastic water tank filled with earth, preferably a little sandy mixture with the dirt.